Supply chain employee Steve Smith makes labels for outgoing supplies. Within every hospital, supply problems are likely to lurk. Often, they're problems of too much: too many sutures, too many surgical staplers, too much of too many items. Hospital staff, distrustful that they'll have what they need when they need it, err on the side of excess. But that's beginning to change, as hospitals and health systems employ software with predictive analytics for inventory management. That way, they can forecast demand, reaching a Goldilocks level of supplies. Users of these inventory management tools will have to integrate them into their existing systems, and they'll also have to learn to trust the data. That's beginning to happen more, as ever-mounting costs are putting pressure on providers and health system staff to act. Supply chain teams are increasingly turning to two-bin systems to store and manage inventory. 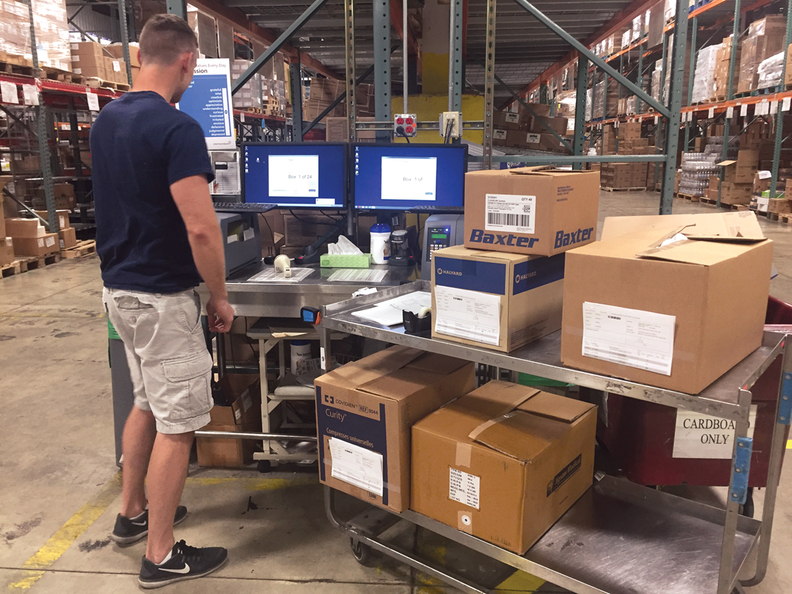 With some software, a member of the supply chain team uses a key fob to scan bins emptied of medical and surgical supplies, sending the information into a digital system that automatically reorders supplies. Because software can track the reorder and empty dates, it can calculate the velocity of the goods—how quickly they're moving off the shelf—and can then forecast when those supplies should be reordered. That approach is purposely low-tech because reimbursements for such products are typically low, said John Freund, CEO of Jump Technologies, which makes supply chain management software. The physical system for keeping track of some supplies is decidedly simpler: bins with dividers, sitting on a shelf. When half of one bin is empty, supply chain staff flip a sign on it to show that the supplies need to be reordered. They also scan the bin, sending a reorder request. Spectrum is moving to this “flipper” for its hospitals from a periodic automatic replenishment process. In doing so, they've gained efficiency, said Bill Selles, director of supply chain at the Grand Rapids, Mich.-based system. They've become more accurate. “There's a sense of relief,” he said, as supply chain staff count many fewer items. “We can basically just handle less product and be much more efficient,” he said. Next, Spectrum will implement more efficient inventory management in its central distribution center, which currently relies on a paper-based system. Going digital will help streamline how supply chain staff pick up supplies, routing them in the most efficient path. Not only will they more effectively manage supplies, but they'll also get a break from walking; right now, the average supply chain person who picks product walks 10 to 12 miles every day. As hospitals increasingly seek ways to better manage their inventory, developers have created software to support their efforts. Jump Technologies' JumpStock, for instance, tracks how quickly providers use supplies, providing the end users with the data to back up the supply chain staff's stocking decisions. “There's a lack of trust between supply chain staff and clinicians,” he said. The supply chain staff think they know how quickly goods move in and out of the system because they stock those goods, and the clinicians think they know best because they consume those goods. “There is not a good set of data for either party to rely on that would allow them to work together to reduce inventory,” he said. To get around that, the software helps manage inventory from the loading dock to the patient, creating a feedback loop. A report for clinicians shows the velocity of supplies—how quickly they move off the shelf—so they can see what's being used. “Looking at that data, clinicians can agree with supply chain staff on the changes they want to make, because they have data that everyone agrees on,” Freund said. In the end, he said, that cuts the amount of supplies on hand, making the entire system more efficient. At Chesapeake Regional Healthcare, for example, since putting the JumpStock software in place, the organization has reduced on-hand labor and delivery supplies by 40%. In four months, they also reduced inventory in one nursing unit by 64%. More efficient inventory management means not only cost savings but also better quality care, Spectrum's Selles said. Right now, he said, “we have the approach of more inventory is better, because the risk of running out of a critical supply is harm to a patient.” But because of that, there's a lot of waste. What's more, if a hospital doesn't manage its inventory well and a medical device recall is issued, for instance, the supply chain staff might not know if their devices are affected. The problem of expiration dates isn't unique to healthcare, Selles said, but its effects are potentially more profound. “If I work for Target and we expire a pallet of yogurt, that's a problem, but it's a wholly different story than if I expire medical devices that end up in point-of-care situations,” he said.